“I am an immigrant,” said Zilpa Oduor ’18 during her presentation, “Refugee Resettlement: The Road to Self-Sufficiency,” at the 2015 Tanner Conference. Established through the generosity of Estelle “Nicki” Newman Tanner ’57, the conference celebrates the relationship between the liberal-arts classroom and student participation in off-campus experiences around the world. Last fall marked the conference’s 15th year. Oduor discussed her experience as a summer intern in the Albany, N.Y., field office of the United States Committee for Refugees and Immigrants (USCRI), which provides services to newly arrived refugees, organizing community orientation and job readiness programs for them. Resettlement is a difficult path, Oduor explained to the Tanner audience, with multiple roadblocks, including language barriers, lack of work experience, and for some, post-traumatic stress from the effort of reaching the U.S.
Oduor traveled a similar road in 2009, moving from Kenya to the U.S., and resettling with her parents and two older brothers in Albany, where she entered eighth grade. For the teenage Oduor, the transition from Kenya to upstate New York was anything but easy. “For the longest time, I just hated it,” she recalls. By high school, however, she had found her niche, getting involved in Model U.N., organizing blood drives, and excelling academically. For a time, she was the face of Albany High School, appearing on posters, buses, and billboards representing her school district. 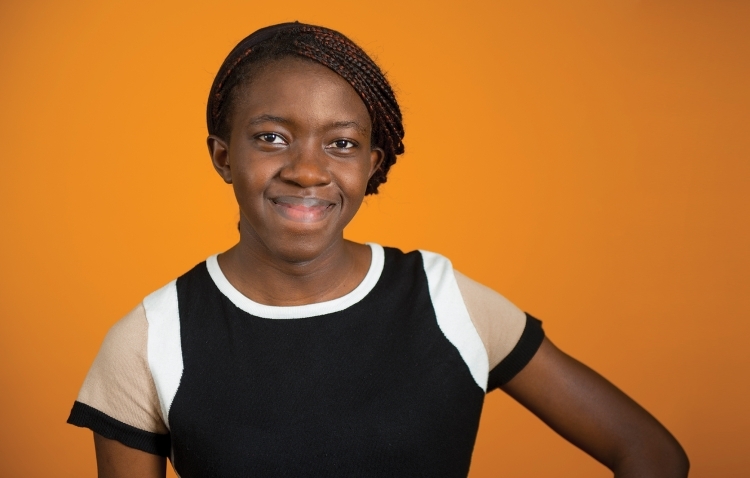 During her USCRI internship, Oduor helped refugees, many of them Syrian, get settled by shopping for food, setting up apartments, and developing employment plans. She often found herself riding buses with her clients, helping them learn to navigate the city. “I think that I became the person that I wished had been there for me,” she says. “When I started working with refugees, they became my friends, because I had wanted a friend to check on me, and just say, ‘Hey, Zilpa, how are you doing? How are you adjusting to life in the U.S.?’ And finding that person was very hard. A lightbulb moment for Oduor happened when she was having lunch with a USCRI staffer last summer. She asked him why he did the work. “I’m here to be part of the justice,” he said.